I live in the State of Georgia, which happens to be where the headquarters of the Coca-Cola Company is located. And it's also the State where pecans are grown. So it does seem logical that someone would come up with a cake recipe that uses both of these ingredients. And it's known as a Coca-Cola Cake. Now, I will say upfront that this is a Southern cake, which means it's sweet. And it's delicious. 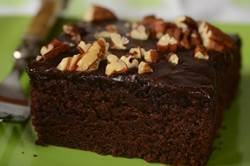 It starts with a soft and moist chocolate cake that, of course, contains Coca-Cola®. Then, while the cake is still warm from the oven, a sweet chocolate frosting (that also contains Coca-Cola®) is poured on top. The finishing touch is a generous sprinkling of chopped pecans. This chocolate cake is one of those cakes where you just mix everything together in a bowl. No mixer is needed. As I mentioned above, the cake batter does contain Coca-Cola®. However, you can replace the Coke® with an equal amount of water. What's interesting is that if you make this cake with water, instead of Coca-Cola®, then the cake is actually called a 'Texas Sheet Cake' instead of a 'Coca-Cola® Cake'. A few notes on ingredients. The chocolate flavor in both the cake and frosting comes from unsweetened cocoa powder. In the cake I like to use 'natural' unsweetened cocoa powder and in the frosting I prefer to use 'Dutch-processed' cocoa powder. Keep in mind that both the type and brand of unsweetened cocoa powder will affect both the taste and color of your chocolate cake and frosting. One of the reasons for the cake's soft and tender texture is that some of the fat is in liquid form (flavorless oil). As far as the type of oil to use, good choices are vegetable, canola, corn, safflower, or even a light olive oil. If you are not familiar with buttermilk it has a nice thick creamy texture with a rich tangy buttery taste that also contributes to the cake's tenderness. You can make a substitute for commercial buttermilk simply by stirring 1/2 tablespoon of white distilled vinegar, cider vinegar, or lemon juice into 1/2 cup (120 grams) of whole or reduced fat milk. Let stand at room temperature for about 10 minutes before using. Another option is to use buttermilk powder which can be found in some grocery stores or in specialty food stores. Coca-Cola® Cake: Preheat your oven to 350 degrees F (180 degrees C). Butter, or spray with a non stick vegetable spray, a 9 x 13 inch (23 x 33 cm) pan. In a large bowl whisk together the flour, sugar, baking soda, and salt. Make a well in the center of the dry ingredients. In another bowl, whisk together the eggs, buttermilk, and vanilla extract. In a medium saucepan, placed over medium heat, melt the butter. Then whisk in the cocoa powder, oil, and Coca-Cola®. Bring just to a boil then remove from heat. Let cool about five minutes then pour into the dry ingredients and whisk until combined. Then stir, or whisk, the egg mixture into the batter until combined. Pour the batter into the prepared pan and bake for about 28 - 30 minutes or until the top is firm and a toothpick inserted into the center of the cake just comes out clean (the cake will just be starting to pull away from the sides of the pan). Remove from oven and place on a wire rack to cool while you make the frosting. Chocolate Frosting: Place the confectioners sugar in a large bowl. In a medium saucepan, placed over medium heat, melt the butter. Whisk in the cocoa powder and Coca-Cola (or milk) and bring just to a bowl. Remove from heat and, whisking constantly, slowly add it to the confectioners sugar, along with the vanilla extract, until smooth. Slowly pour the warm frosting over the warm chocolate cake. Sprinkle with the chopped pecans. Let cool. Can be covered and stored at room temperature, or in the refrigerator, for about five days. Note: To toast pecans. Place pecans on a baking sheet and bake in a 350 degree F (180 degree C) oven for about 6 to 8 minutes or until lightly browned and fragrant. Let cool and then coarsely chop. Coca-Cola and Coke are trademarks of the Coca-Cola Company.